Hello everyone, hope you had amazing and relaxing holidays. 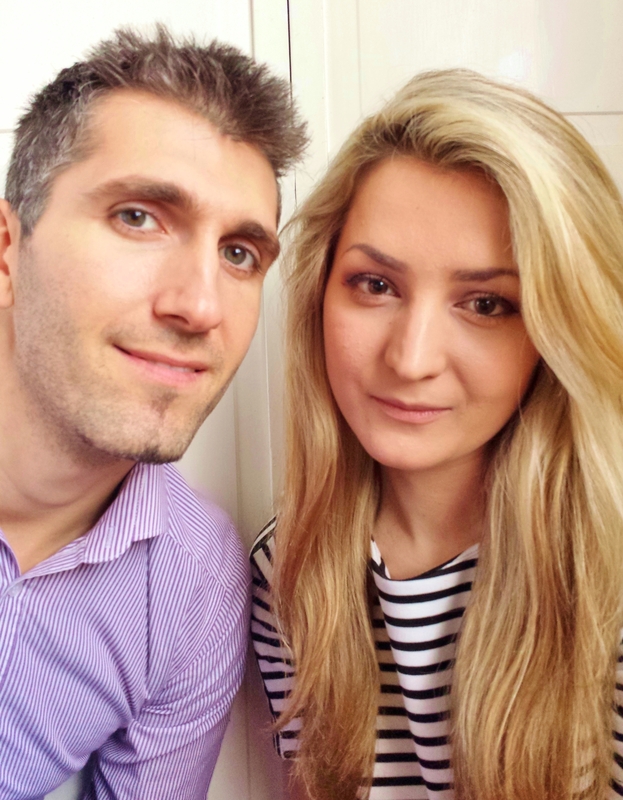 Me and my husband had a lot of delicious food during the past weeks, so we are trying to limit the amount of fat in our food in order to return to a more healthy diet but also not leaving the delicious taste aside. 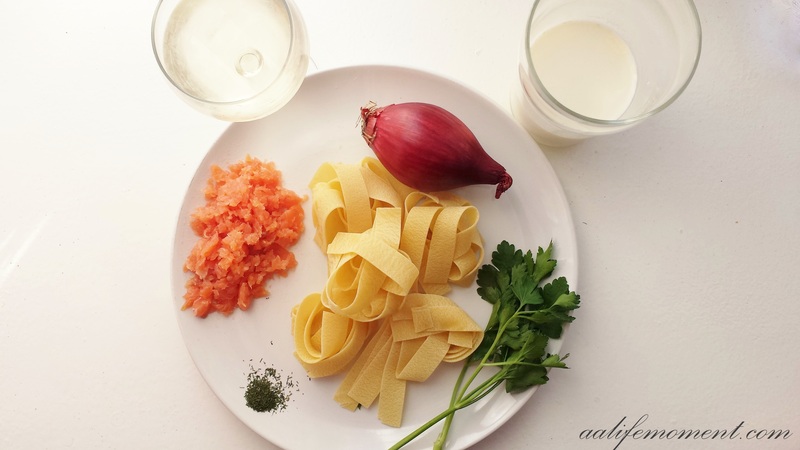 In fact, this creamy smoked salmon pasta is a perfect choice for when you want to switch to a healthy but delicious regime as it has smoked salmon, red onion, no cream (instead I used whole unhomogenised milk – which is a much healthier version than the original one) and white wine. All these ingredient work amazingly well with each other as they create the most creamy, rich flavour from the smoked salmon which is beautifully accompanied by the sweet onion and sharp dry white wine taste. First of all chop the onion into very small pieces and cook it on a frying pan with one tablespoon of olive oil and salt in a slow heat for about 5-8 minutes. Then add the chopped smoked salmon and cook everything together for about 5 minutes. After that, turn the heat from low to medium, add the white wine and cook all the ingredients until the alcohol evaporates (until you don’t smell the alcohol). Then add the chopped parsley, the milk and cook everything until you reach the creamy constitency. Meanwhile cook the pasta (al dente) then drain it and add it to the frying pan to mix everything together. At the end, add some dill and some chopped parley and serve it. 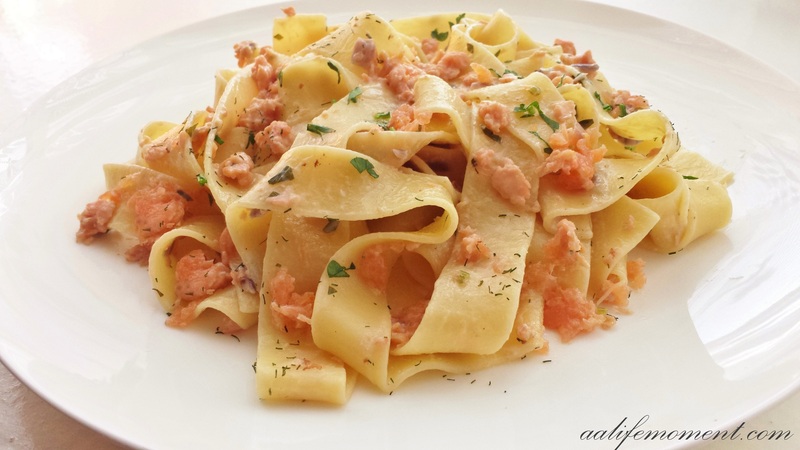 I hope you will like this healthy but delicious version of smoked salmon pasta version. I think the creamy costitency and beautiful pale pink-orange colour in the plate makes this dish perfect as a special treat. See you at the next recipe and thank you very much for the appreciation you show to my blog! Awww thank you so much MyKabulKitchen for always being so kind, I really like this type of pasta recipe as the results are delicious and the colours are beautiful! Alice, pasta & smoked salmon is one of my favourite suppers that could be thrown together in a cinch but this is so different! I love it. Chopping the salmon and using milk, almost a ragu, superb. Next time, I’ll try this. Wishing you a nice week as well, Nicole. 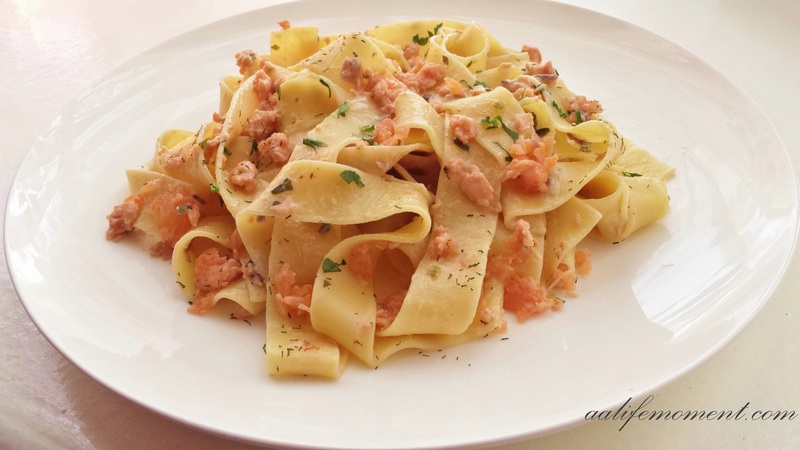 Thank you so much Nicole, I am really happy you like this version of smoked salmon pasta. Please let me know how it goes! Aww thank you so much for the lovely words Kat. I am really happy you like the recipe.I really do appreciate! We make the “unhealthy” version at our home in Northern Italy. We use “panna da cucina” , a cooking cream that comes in little mini milk carton looking package. I’ve checked all over here in the USA and I can’t find this product. It almost solid with just a little liquid and is very unlike American cream. We make our version topped with small capers. Yes, my husband and I have the same problem here in UK, we generally replace “la panna da cucina” with single cream which is much healthier but not thick as the italian panna da cucina. 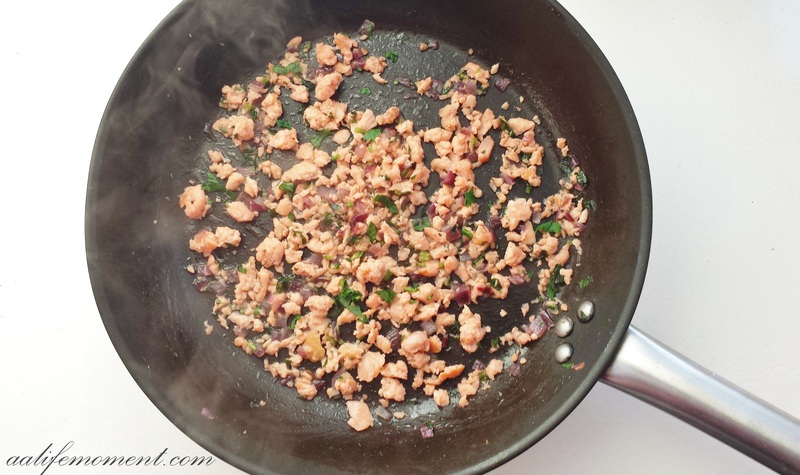 Love the “healthy” part of the recipe! Also, photos are so pretty. Love the healthy idea. Also love the pretty photos. Looks very nice, fancy but tasty. I love smoked salmon in just about anything and this sounds great! Such a nice dish post-holidays too. This looks so easy and delicious. I am definitely making it! Lol, Thank you very much for the nice words! This looks wonderful! My husband and I are also shaking off a few bad holiday habits. Lol, thank you for the nice words Bernice! You really can never go wrong with pasta. You styled those long, flowing noodles so beautifully, too! Aww thank you so much Hannah for the nice words, please give it a go! I would love to hear from you the results! 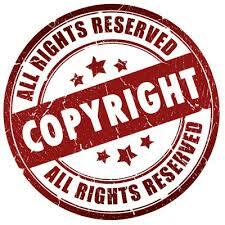 Alice, I’m with you for adjusting recipes for better health without abandoning traditional ingredients. Bravo! I look forward to trying out this recipe. Is it too colorful to eat? LOL? Thanks for passing this recipe on! Lol, thank you for the nice comment, I really hope you give it a go! Thank you so much for the nice words Baker’s Craze , I really hope will like the results as much as I do. Thank you again! Aww thank you so much for the very kind words. I love photography and love taking food pictures even more. Thank you very much please do give it a go! I am sure you will like it! Looks delicious! This is not helping with my fish and pasta addiction! Thank you so much Ana Moniz for the very nice words. I am happy you like it! Thank you so much Fiver Feeds for the nice words. Please do give it a go, I am sure you will like it. Sounds delicious! What milk would you recommend for a dairy free version? Soy, rice, coconut, almond or something else? Thank you SliceofChanelle for the nice words. I would recommend a mild (not overpowering taste of milk) and the one which gives you a creamy texture. I think soy and rice milk would make a great substitution. Let me know how it goes. Oooh! I have to try this! Thank you so much, I am happy you like this version.